The term Big Five was originally referred to by the early big-game hunters. It was used as way of describing 5 of Africa’s most fierce, elusive, difficult and dangerous animals to hunt for on foot. These days the phrase has come to represent the most sought-after safari sightings, although, it does come down to one’s personal preference. But even just witnessing one of the Big Five will always remain embedded in your memory for years to come. On an Origins Safari adventure, a “hunt” for the Big Five will be with your binoculars and camera! So, WHO are The Big Five? 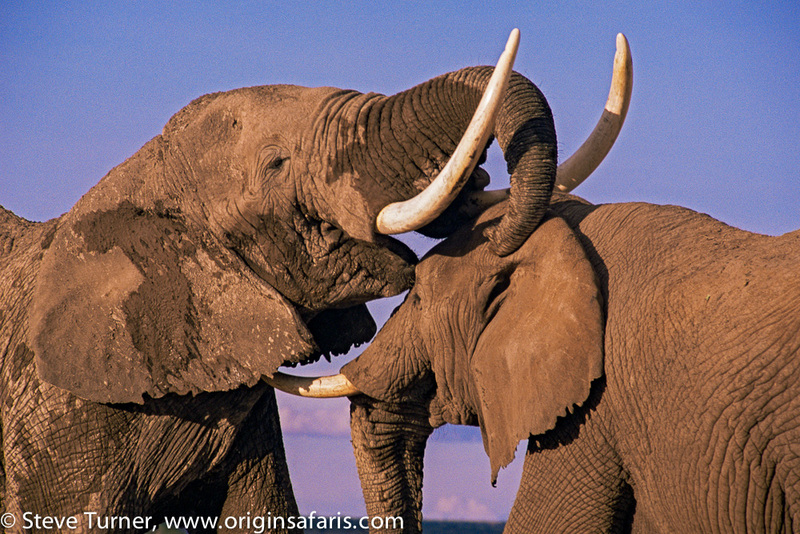 The African elephant is undoubtedly one of Africa’s most iconic animals. It is the largest of the Big Five and the largest land animal in the world. They are known to be incredibly intelligent, emotional, self-aware, and social creatures. Seeing these graceful giants is always a favorite for most visitors. Some of the greatest joys are watching them in their natural habitat; interacting with each other, looking out for each other’s calves and occasionally watching an adorable and playful calf learning how to use their trunk. They truly are a wonder to behold. African elephants are commonly referred by many as gentle giants; however elephants are wild and can be dangerous when they feel threatened. The African elephant has a gestation period of 22 months; they have the longest gestation period of all mammals. Elephants can spend up to 18 hours a day eating. They can eat up to 300 kg of food, drink up to 189 liters of water and expel to 150 kg of dung a day. Their feet are columnar and walk on the tips of their toes. Their heel is supported by a cartilage pad which adds as a noise absorber. Elephants, like humans are either right or left handed and because of this either their right or left tusk will be worn down depending on their dexterity. Elephants have good hearing, but they also detect sub-sonic vibrations through their sensory cells in their feet. They can detect vibrations up to approximately 10 km as well as determine which direction they are coming from. The lion is the largest of Africa’s big cats, and is often referred to as the “King of the Jungle” or “King of the Beasts”. This mighty animal is arguably amongst the top wanted animal on most safari goers’ wish list to view in the wild. Unlike other big cats, lions are social animals. Lions belong to a pride, which usually contains between 2-20 individuals; most are adult females with their offspring varying in age, and sometimes 1-6 males. 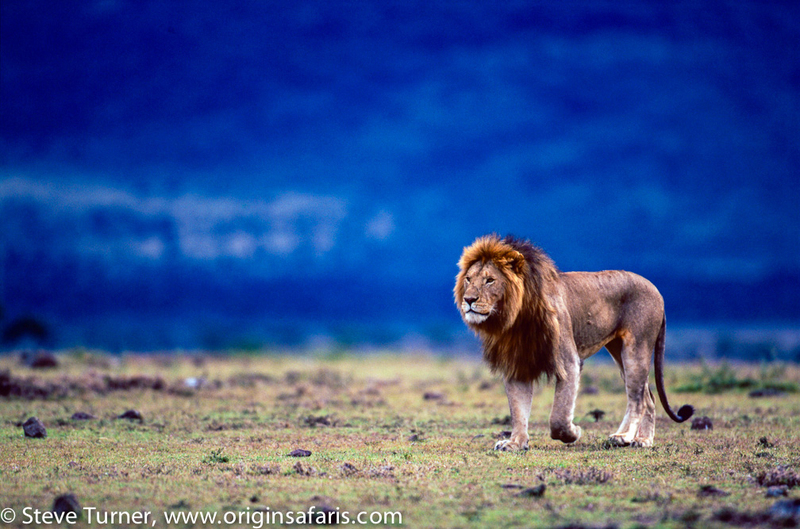 Lions can be a familiar site in both Kenya and Tanzania. You might be lucky to find them snoozing under the cool shade of a tree or bush during the heat of the day, or scanning the plains in the early evening, like kings and queens looking over the “pride land”. Mating can occur every 15 minutes for up to 5 days! This can add up to 250 times over 5 days. Lions can be identified by a number of characteristics such as ear tears, facial shapes, scars and colour. But whisker spots are the most consistent as they remain the same throughout a lion’s lifetime. On average, lions can sleep between 18-20 hours a day. They have few sweat glands, so they sensibly conserve their energy during the day and then become more active at night when it is cooler. A male lion’s roar can be heard from as far as 8 km away. Babies are not just called Cub’s, but also referred to as a whelp’s or Lionets. The leopard is the most elusive of the Big Five animals. They are unbelievably beautiful and are relatively easily recognizable, if you can spot one of course! Unlike lions they are usually found alone. They are masters of disguise, they are mostly active in the early mornings and night, which means that they can be very hard to spot during the day, so don’t forget to bring your binoculars on your safari as you’re likely to spot a leopard hiding and resting in the trees or in the undergrowth rather than in the open. Leopard spots are referred to as “rosettes” as they are similar to the shape of a rose. Their light coats patched with dark rosettes provide exceptional camouflage for these elusive hunters, especially in the dappled shade of trees. A leopard’s vision at night is 7 times that of a human and hearing 5 times better than a human. Leopards are renowned for their agility and have the perfect build for hunting. They are excellent swimmers and have been recorded to run up to 80 km/h in short bursts and jump over 10 feet into the air. Leopards are incredibly strong. They are able to drag their prey (sometimes twice its size) up a tree so that lions and hyenas can’t get their claws on it. 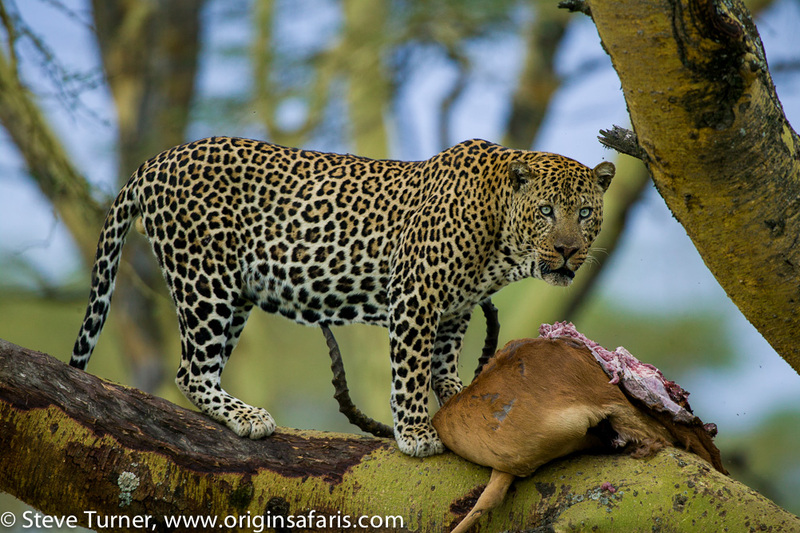 Often leopards will leave their prey in the tree for a few days and return when they are hungry. 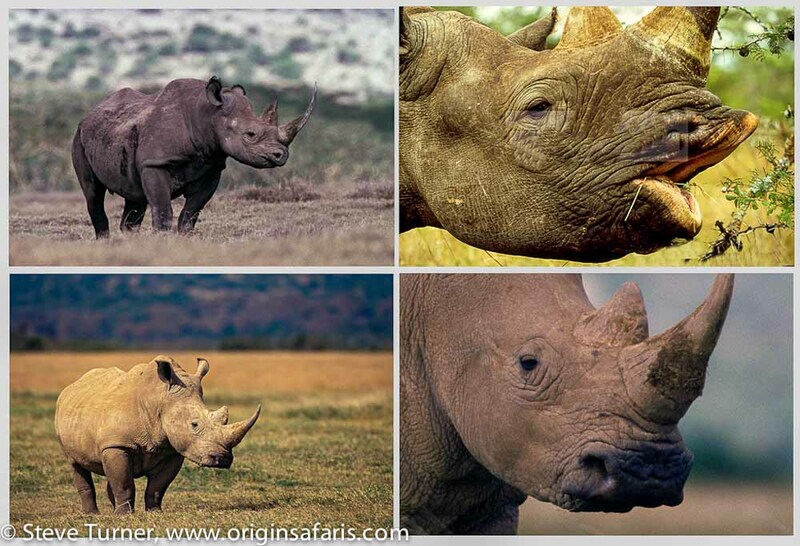 Definitely the rarest of the Big Five is the Rhinoceros. These horned animals roaming the African plains almost look prehistoric; a magnificent creature from an ancient past… Seeing one at a distance is a rare treat! There are two types of Rhinos – black and white. Both are at high risk of extinction due to the poaching endemic caused by the increasing demand for rhino horn in some Asian cultures. It is estimated that there are approximately 5,000 black and 20,000 white rhino are left in the wild. Despite their names. There is no difference in colour between the black and white rhino. One of the easiest ways to identify them is to look at their lips – The black rhino’s lip is pointed and prehensile, while the white rhino’s lip is flat and wide. The Dutch word “wijd” means “wide”; the word was mispronounced and therefore gave the white rhino its name. A rhino’s horn is made from a protein called Keratin, the same substance that human hair and nails are made from. The word rhinoceros is a combination of two Greek words: “rhino” meaning nose and “ceros” meaning horn. The collective word for a group of rhinos is a “crash” of rhinos. 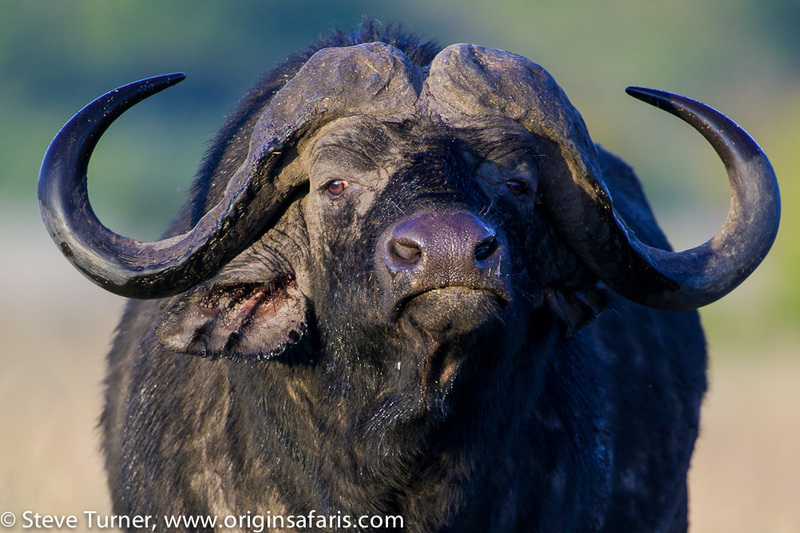 The African buffalo may look bovine, but don’t be fooled, they have made their way into the Big Five for a reason. When threatened they are immensely powerful, fast, aggressive and ruthless, which has earned themselves the reputation of being one of Africa’s most dangerous animal. They have killed more humans than any other animal, even more so than the hippopotamus. Buffalos are very easy to identify when on a game drive as they look like “a cow on steroids”; their coats are thick and can range from a reddish brown to black in colour, they have very large and deadly bossed horns along with a serious and menacing stare. In order to survive, the African buffalo needs to drink water every day. Usually they are never more than 15 km away from water. An adult buffalo can drink as much as 45 liters of water in one go. When on safari you will see a small bird sitting on the hide of a buffalo. They are called Oxpeckers. They have a symbiotic relationship with the buffalo as they remove ticks, parasites and insects that are embedded into the buffalo’s skin. Buffalos are gregarious animals and safety in numbers is very important. At times you can find herds of 20-1,000 animals! When herds are threatened by predators, the dominant bulls tend to put an aggressive and intimidating front while the other adults gather around the calves to protect them. A mother and calf form very strong bonds, as is the family bonds in the herd. All females will respond to a distress call of a calf. The African buffalo is a large an imposing animal. A mature male buffalo can stand up to 5.6 feet at the shoulder, have a horn span that can exceed 3 foot and weigh up to 900 kg. Our luxury camping safaris to Africa offer adventure in lavish comfort. With over 50 years of experience, our depth and knowledge is unmatched. We are constantly creating new and innovative excursions so that you can truly experience the excitement and romance of a traditional safari under canvas in a lap of luxury. Let Origins Safaris help you to experience Africa. Contact us on www.originsafaris.com for more information.